There is a wall in this house that has been driving me crazy since we first moved in. It is at the end of a long hallway. It is quite large. And it is BORING. I decided to create a gallery wall there some time ago, but I was dragging my feet a bit. I wasn't sure exactly what type of gallery wall I wanted. So I gathered inspiration and finally decided that I wanted something fairly cohesive but a bit organic. First of all, I had to make a decision about the frames. Did I want black frames? White frames? Mismatched frames? I finally decided that I wanted white frames...and not just any white frames. I wanted matching white frames. And I couldn't spend a fortune. So I went to IKEA and found some in a couple of different sizes (some for 5x7s and some for 8x10s). 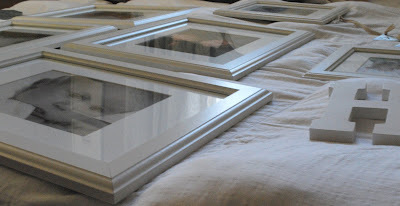 I am ashamed to say that after I got the frames home they sat...for quite a while. Because I had decided that I wanted the gallery wall to be a bit organic, but I wasn't sure how I wanted to accomplish that task. Remember when I told you yesterday that I had the perfect place for my sweet Lisa Leonard pennant banner? Well, once it arrived in the mail, it gave me the perfect idea for how I wanted to finish my wall. 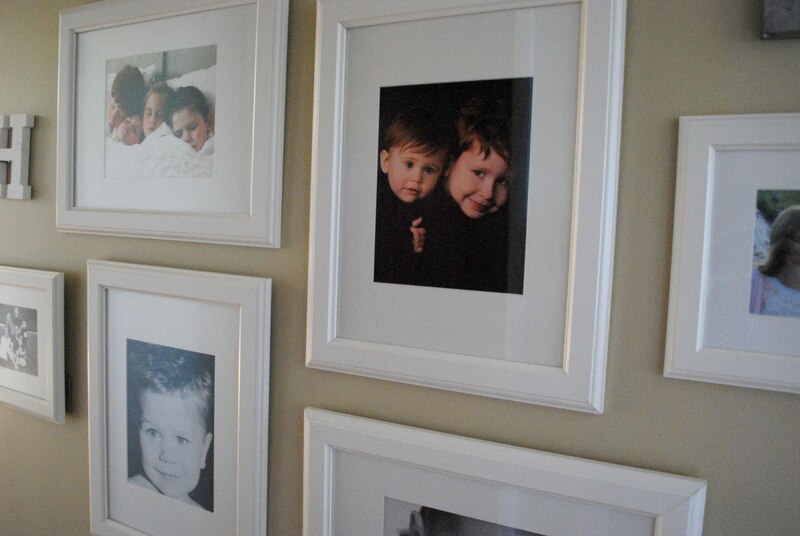 So I gathered up my photos and filled those frames. Then, I laid the frame out on my bed to get an idea of how I wanted them to look on the wall. 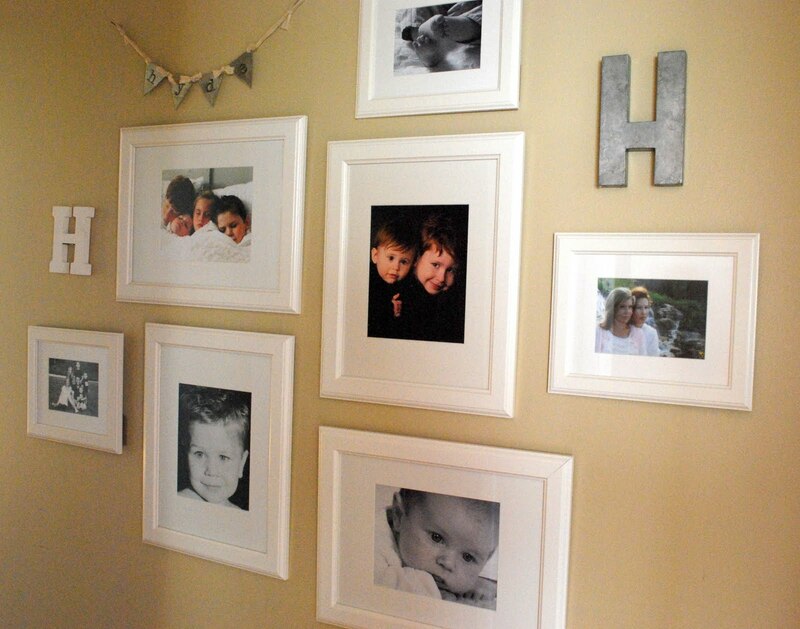 I've seen a lot of gallery wall tutorials with kraft paper and carefully measured placement. And those are wonderful. But I am not that girl. Impatience is my middle name...and I love to eyeball things. (When I'm doing things for myself that is.) So I started with the middle photo in the collage and moved out from there. Eyeballing measurements as I went. 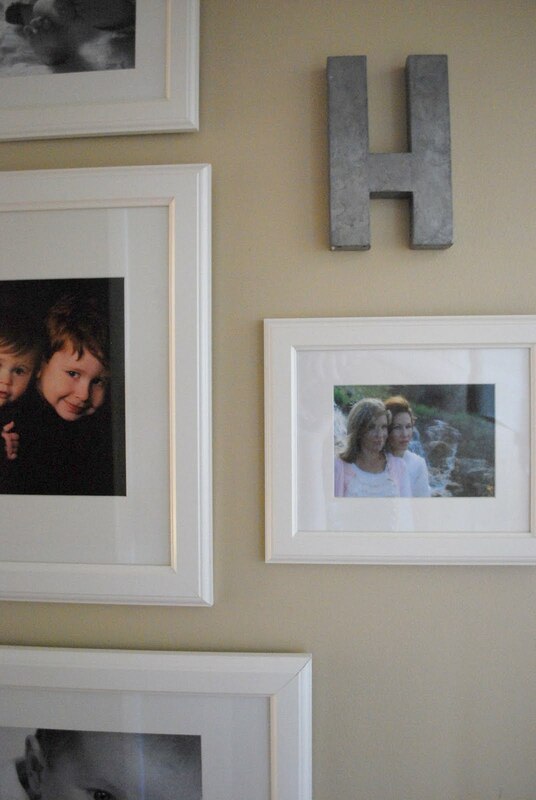 And to add to the organic/ eclectic feel of the wall, I threw in a couple of monogram "H"s. This metal one is from Anthropologie...it used to sit on the white buffet in my living room. The white "H" came from JoAnn's. And then, the piece de resistance my pennant banner. Love. it. Here's the finished wall again. I'm so happy with the way it turned out. There's still time to enter the $75 Lisa Leonard giveaway...just scroll down to yesterday's post and leave a comment! This is so very much on my to-do list. We've never been photo people but now with the wee one we want to "family-up" the place more than just having an endless supply of toys around. I did one of these last year and am totally in love with it! I get so many compliments too :-) So much fuN!! I have that Blah wall in my house - every time I look at it - I think i need to do something! There are so many options I just need to make a decision and stick to it - right! It turned out great!!! Love the organic feel, the simplicity yet detail. Perfect! Love, Love, Love! I want to do this so badly in a spot in my home. I'm new to the whole homemaking thing, but loving every minute! 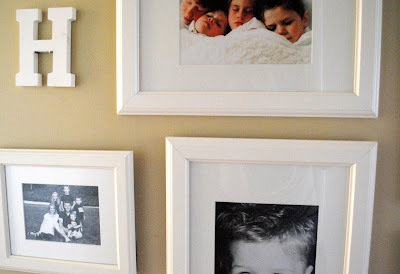 Question- how did you hang your frames? 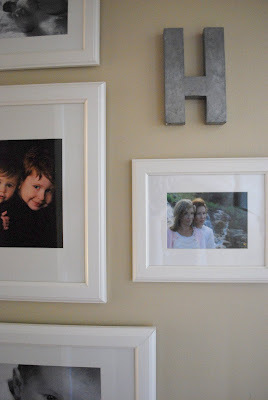 Do you have to buy wall frames, or is there a way to hang the others?? I just finished my gallery wall yesterday and hopefully can post it soon! I hope you foot is feeling better, girl! It looks great! I love my gallery wall!! Have a blessed day! I LOVE the clean, simple feel. And gorgeous photos! Love it! I'm with you, I prefer to eyeball it and think it looks better when things aren't exactly measured out! Absolutely fantastic! Love the H's!! I love this! I have been wanting to do something like this for a while now, thanks for the inspiration! 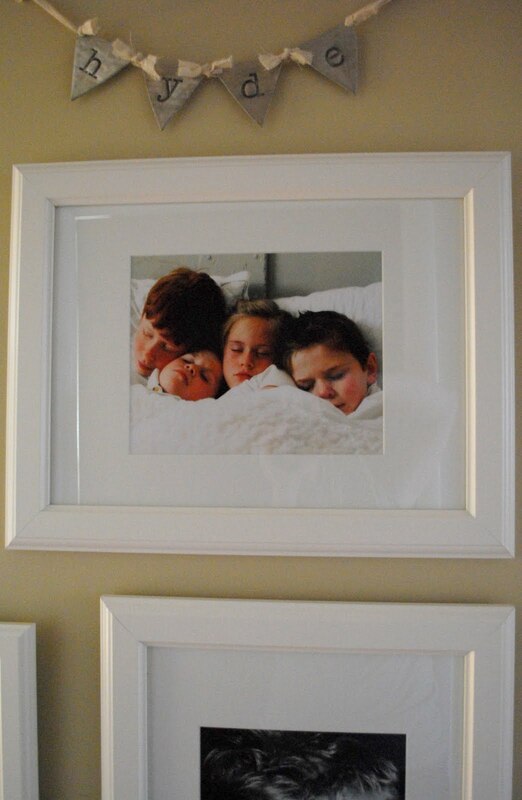 Love you framed wall...adorable photos and all so personalized with the banner and all. Great job! I love your wall! It looks so good! I just finished one and posted it this week. It is okay but I LOVE yours!! Makes me want to tone my down a bit. Great job! I am just in the process of creating a gallery wall and had never thought of adding in the letters and a banner like that. I love that idea!!! Looks fab! ps - I totally shop at Ikea for frames too. They are simple and elegant.